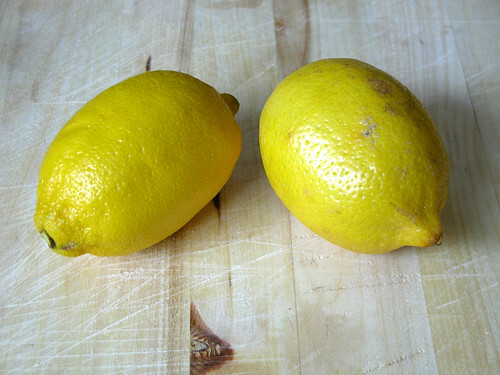 Weird story – up until I tried this recipe, I didn’t like lemon in sweet things. Hated it. Thought it was weird. Maybe it was thanks to the dodgy lemon meringues that were knocking around when I was a kid, but I just couldn’t understand why people liked lemon in sweet things. Now I’ve been converted by lemon posset, I realise that it’s just that I don’t get on with the supersweet, barely tart kind of lemon puddings. I like my lemon desserts sharp and creamy! I’m not saying this isn’t sweet – it is – but it’s balanced by the sharpness of the lemons perfectly. I can say all this because it wasn’t me who invented it! The recipe is supposedly based on a medieval dish of milk curdled with wine or beer, with spices added to it. The alcohol would curdle the milk, which was supposed to be a great cure for things like the cold. Even today, we drink hot milk to get to sleep, so I guess it’s evolved since then! It’s also mentioned in Macbeth, when the evil Lady Macbeth uses possets to knock out Duncan’s guards. This recipe works on a similar principle – but instead of curdling the cream, the lemon acts to set it, creating a dense, smooth and creamy taste. You can add grated lemon zest to this, but I prefer to keep the smoothness of the cream totally uninterrupted by the nuggets of peel. Combine the cream and sugar in a pan, and heat until scalding – but do not boil. Whilst on the heat, add the lemon juice and allow to boil for 30 seconds, whisking to prevent the cream from burning. Allow to cool before pouring into bowls and placing in the fridge until set. Some people like to serve this with shortbread or other crisp biscuits, but I really don’t think it needs any additions!